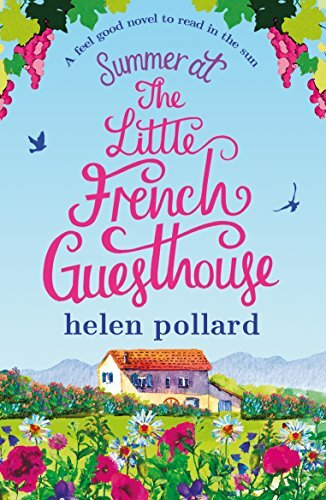 I read the first in The Little French Guesthouse series last year and loved the feel-good romantic story which has such a great setting. You can read my review of that here. I haven’t had the chance to read this one yet but that gorgeous cover has me totally in the holiday mood and once again wanting to visit France! The pounding on the guesthouse door sounded like a battering ram. Throwing myself out of bed with much toe-stubbing and cursing, I glanced at the clock on the dresser. Five thirty a.m. What the …? I scrabbled in my cluttered top drawer for the key of the door that linked my quarters to Rupert’s – only to be used in emergency – but when the next onslaught began, I gave up, grabbed a hoodie and staggered out through my private entrance and around the outside of the building. Believe me, gravel is not an ideal surface for bare feet. I would have gone back for flip-flops, but I was desperate to stop the violence on the door. My heart stuttered in my chest as I rounded the corner to see that the racket was being perpetrated by a gendarme. What was wrong? Who had been hurt? Had I only imagined hearing Rupert’s return from the UK late last night? Had something happened with that wretched ex-wife of his? Had he been in an accident? I looked across the courtyard and whooshed out a sigh of relief when I saw his estate car, although I wasn’t sure why it had a tarp thrown over it. The gendarme’s fists were raised, ready to knock again. ‘Arrêtez, s’il vous plait!’ I waved madly at him as I painfully ooched and ouched my way towards him, eventually stepping blissfully onto the smooth doorstep. ‘Can I help you?’ I asked in my best French. Despite living in France for almost a year now, I’d had little experience with gendarmes – but I presumed it was best not to mess with them. He was middle-aged and portly, with a poker face that fell by degrees as he took in my shorty-pyjamas, bed hair and bare feet, then glanced at the corner I’d appeared from. No doubt he was wondering why I hadn’t opened the door like a normal person and saved my feet from laceration. At that time in the morning and that stage of caffeine intake (nil), my French wouldn’t stretch to explaining. In rapid French, he began to interrogate me. Who was I, why I was there, did I know Monsieur Rupert Hunter and, if so, where was he? Alarmed, I tried to formulate a coherent response, but I was mercifully saved when the door opened and Rupert stuck his head out. He looked dishevelled – unshaven, his wavy silver hair uncombed, a bathrobe half-thrown on over boxers. The gendarme didn’t wait for me to reply but repeated his interrogation, and when Rupert confirmed that he was indeed the hunted party, the diatribe lengthened. Rupert looked shell-shocked, but I watched as enlightenment dawned. Thank God he knew what this was about. All I could gather was that something or someone had been abandonné. Rupert invited our visitor in, took him into the kitchen and got to work at his state-of-the-art coffee machine to placate him with a strong espresso. It did the trick. The law-upholder thawed with each sip as Rupert launched into a lengthy explanation, something to do with the car and tyres. I didn’t tax my brain by trying to follow, since I intended to get the English version shortly. Rupert propped his broad frame – leaner nowadays – against the counter as he spoke, occasionally scrubbing at his close-cropped grey beard as he sought an explanation that would soothe, rather than inflame. Seemingly satisfied, our uniformed friend departed with stern words. Ignoring me, Rupert set to again at the coffee machine, delivering the goods into my shaking hands and slurping his own as though his life depended on it. We sat at the large pine table and I gave him a questioning look. ‘We had an incident on the way home,’ he declared. Saturday was gîte changeover day, and since it was the height of summer, that meant all three to clean out and get ready for arrivals. And a departure and a set of new arrivals for the guesthouse. And a guest meal to cook. He staggered off, and I sorted out fruit and yogurt and toast for him. I couldn’t help but feel sorry for Bob, our local hippie biker and soon to be my wedding photographer. The poor sod had already given up his time to drive and lift and carry and referee between Rupert and his very-nearly-ex-wife. That bloke deserved a good friend award. The dog had begun to whine in Rupert’s lounge. Since neither of us had time to walk her, I let her out into the small orchard at the side of the house to do whatever a dog needs to do, grimacing as I watched her crouch, then sighing as I grabbed a plastic bag and trudged out to pick up after her. I wasn’t sure that was on my official job description. Not that I had an official job description. The daft black Labrador was off, slaloming around the trees, the morning sun slanting through the leaves, the grass beneath her paws green and lush and dew-speckled, and I whistled for her to come back in. I refused to call her name as a matter of principle. I honestly believed that Rupert’s decision to call her Gloria in a moment of irony was the worst idea he’d ever had. Nowadays, the dog seemed able to distinguish between when Rupert used the name Gloria to refer to her and when he was referring to the human Gloria, perhaps due to the differing intonation – joyous enthusiasm for his pet and weary resignation for his ex-wife. But as far as I was concerned, she was ‘sweetie’ or ‘the dog’, and, fairly frequently, ‘that bloody dog of yours’… Although one look from those woeful eyes always made me melt, and I couldn’t resist burying my face in her soft fur when we were lounging together. When I saw her emerge from a tall hedge and streak towards the house, safe in the knowledge that she would settle in her basket in the hall, I went into the kitchen to lay out breakfast. Heroically forcing my hand away from the pains aux raisins, I grabbed a banana and gulped it down as the first guests appeared. They seated themselves at the scrubbed pine table under the sloping roof of the kitchen extension, away from the business end of the kitchen, to enjoy the late July sunshine pouring through the large window and patio doors, and to peruse the breakfast goodies. When I asked if they would like eggs (laid by Rupert’s own chickens) and how they would like them cooked, I carefully omitted the fact that, with Rupert absent, they would get a much-inferior version. Despite his careful tutelage, eggs and I still did not get on from a culinary point of view. Hopefully, any disappointment in the egg department would be offset by the array of fresh pains aux raisins, croissants, pains au chocolat, chopped fruit, yogurt and local-made preserves, to which our guests helped themselves as I brought coffee and tea to the table. Breakfast was a busy time of day and meant a very early start, but I could hardly complain with the sun shining, the view of the garden through the patio doors so appealing, the table laden with goodies, the guests in a good mood and ready to start their day, happily chatting with each other and swapping sightseeing tips. With Rupert not available this morning, they turned to me for advice and I readily supplied answers to their questions, pleased that my knowledge of the area had improved so much over the past year. For the zillionth time, I thanked my lucky stars that I’d found this place – and that I’d found the courage to take up Rupert’s offer to live and work here. I didn’t regret it for a single moment. I may not have thought it at the time, but my now-ex-boyfriend Nathan had done me a substantial favour by sleeping with Rupert’s wife while we were on holiday at La Cour des Roses last year. If he hadn’t, I never would have stayed behind to help Rupert through his illness, fallen in love with his home and business, made such a good job of looking after him and La Cour des Roses that he offered me a permanent position here, made a new life for myself away from the rat race, and made a bunch of fantastic new friends while I was at it. And, of course, met the man I was due to marry soon. My morning idyll was shattered by an ear-splitting shriek. When I’d recovered my wits, I streaked into the hall to find Abigail Harris clutching her chest in a dramatic manner, her husband Brian patting her arm. ‘What’s the matter?’ I asked, thinking my heart might need massaging, too. Abigail pointed shakily at the dog, who was curled up peaceably in her basket, cuddling her blanket and … something else. I peered closer. Her velvety head lay next to what at first glance looked like a well-chewed soft toy but upon closer inspection was a rabbit carcass. An ancient rabbit carcass – nothing more than a frame of bones, with mangled fur dangling off it here and there. ‘Gloria, you bad girl!’ I wagged a finger at her, forgetting my aversion to her given name. She gazed back at me with those adorable big eyes of hers, but I wasn’t in the mood. She settled further into her basket, lovingly nuzzling her prize. It turned my stomach, to the point where the banana threatened a comeback. As they left the scene of the crime, I gave the dog a stern glare, but she wasn’t budging. With a frustrated sigh, I opened the door to Rupert’s quarters and resorted to lifting the basket with dog, rabbit carcass and all. She weighed a ton, but I carried her through to Rupert’s lounge where we could fight over possession in peace. I figured all I could do was wait for her to go to sleep and then sneak the offending – and offensive – item away from her. Just another day at La Cour des Roses. Summer sun, chilled, white wine, and a gorgeous fiancé. Nothing could upset pure bliss … Right? Emmy Jamieson loves her new life in the gentle hills and sunflowers of the lush French countryside, managing La Cour des Roses, a beautiful, white stone guesthouse. With marriage to caramel-eyed Alain just round the corner, things couldn’t be more perfect. The odd glass (gallon) of wine dulls the sound of Emmy’s mum in full motherzilla-of-the-bride mode, and the faint tinkling of alarm bells coming from Alain’s ex are definitely nothing to worry about. Guesthouse owner Rupert and a whole host of old and new friends are there to make sure nothing gets in the way of Emmy’s happiness. But as Emmy gets close to the big day, a secret from the past throws everything decidedly off track. Will her idyllic French wedding go ahead as planned, or will Emmy run back home to England with a broken heart? This summer, escape to the rolling vineyards of France for an utterly uplifting read. Fans of Jenny Colgan, Debbie Johnson and Nick Alexander will want to join Emmy for a pain au chocolat in the sun-drenched garden at La Cour des Roses.